It's hard to believe the year is over half gone, and I'm over half done with the festivals for this year. But this makes for an opportune time to look back! And by looking back, I mean both since I embarked on this endeavor, and with a slightly longer gaze, over 30+ years ago to the beginnings of my experience in retail. At the beginning of the year, I was struggling with a very basic question of storage: where to put all the pieces in my shop with limited shelf space for the first two product lines. An early panic: where am I going to put everything? For how that was solved, read up here! I now have over 20 distinct products, most with several varieties, for well over 100 lamps and small items ready to go! Shortly after addressing the storage issue, I was prepping for the first show: designing price cards, ordering fitted table cloths, and figuring out how to power the lamps without a generator. I got it all going at the one-day show at the DeAnza Flea Market, with a four hour setup (with help) and a two hour break down for three modestly populated tables. Novato in June - shelves, grid walls, ... and my mother helping out! And now, I've gotten the display figured out, what with a more fully stocked booth, with walls, shelves, and better table cloths! Though it's a lot more involved than the original setup at DeAnza, setup and breakdown goes much faster with a little practice. And the product line has quadrupled since the initial launch, with even more pieces and designs still in the works. With my Mom helping out at the latest show, its the perfect time to look back even further. A few friends have been surprised I enjoy the retail customer action part of the job. It's certainly a lot different than the last twenty years or so of my career in the technology field at the likes of Google, Oracle, and Microsoft. But my Mom had a retail business herself where I spent many holidays or weekends pitching while growing up in upstate New York. She sold Judaic and Israeli gifts, starting out first by manning the temple gift store at our synagogue in Pennsylvania, then growing to a home-based business doing sales for the holidays and other events when we moved to Rochester, and finally graduating to her own retail shop. My Mom, on the right, running the Chanukah bazaar in the late 80s. Tradition's 2nd storefront, at the Twelve Corners Plaza. Though I helped at a few of the festivals, I spent many more afternoons helping out at the register, ringing up sales, answering the phone, helping customers, and yes, occasionally building (or destroying) something alongside my Dad, who built many of the fixtures in the store himself. I also have vague memories of feigning a cough and holding the thermometer against a light bulb to stay home from school in the dead of winter, curling up in a sleeping bag under the table in the storeroom. And my best memories of New York City - a good six hours from Rochester - are roaming the aisles of the New York International Gift Show Javitts Center, with millions of square feet of every possible gift under the sun, available to anyone with a business license, so long as you're buying a gross at a time. That's me in the front in red, and my Dad on the right, in 1987, pitching in on some demolition at Tradition's original location. 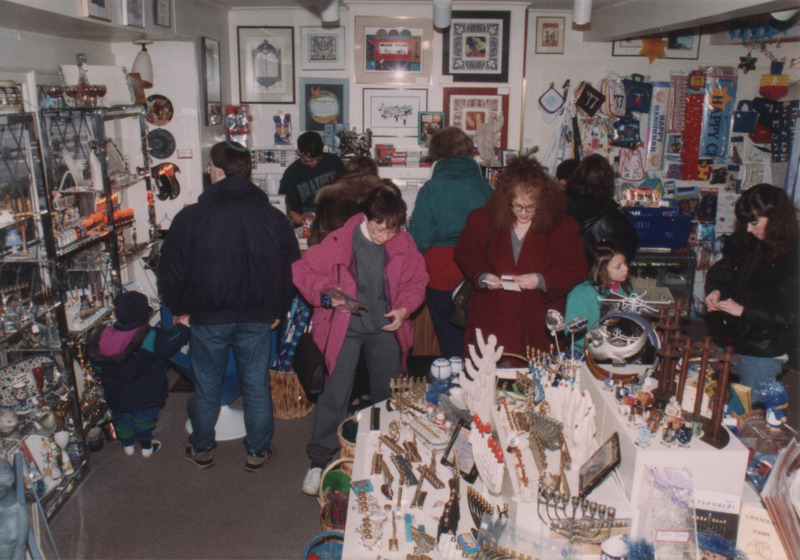 A busy Chanukah in the early 90s at Tradition, with me just vaguely in the back left, in the dark green shirt, manning the cash register. My Mom closed Tradition with her retirement in 2007 (read about the closing pg1 pg2), but her 25 years in business gave me plenty of time to pick up an appreciation of and enjoyment for retail.